My grandfather died in March 1990, just after I started publishing Raising Arizona Kids magazine. It always bothered me that he never saw it. And it always bothered me that just as I was really beginning to understand him, he was gone. Arthur Smock was a stern, self-disciplined product of his generation. As a young husband and father trying to make a living during the Great Depression, he had to be. He didn’t have the luxury of following his dreams or holding out for career fulfillment. He had to put food on the table. 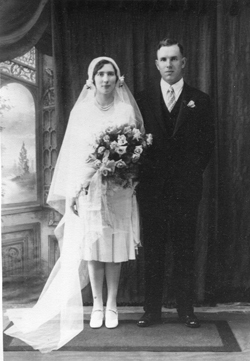 He ran a small dry-cleaning shop housed in a stand-alone garage just outside the kitchen door of the house in which he and my grandmother raised four daughters. 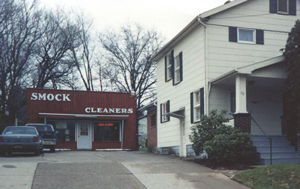 Until he got his business established he’d spend hours going from house to house in his western Pennsylvania community, introducing himself and looking for business. He built a reputation — and a loyal following of customers — because he’d do whatever it took to ensure the highest standards of quality in his work. He worked from just after breakfast until well into the evening. In the summer, deep circles of sweat formed on his shirt as he hovered over hot steaming equipment and irons. When I was growing up, I feared my Grandpa Art. Because he worked so hard for everything he owned, he was highly intolerant of curious young minds and the sticky fingers that often accompanied them. My brothers, cousins and I all have clear memories of Grandpa barking, “Get your hands off of that!” When I was older, and working hard to pay for my own things, I understood what he was trying to say: Show respect for the efforts of others. Grandpa Art was my first and most profound inspiration for the entrepreneurial path I eventually took. He was the one who showed me that hard work and integrity of purpose were the truly essential elements in running a successful business. He taught me things like “the customer’s always right” and “if it’s worth doing, it’s worth doing right.” But it wasn’t until yesterday that I grasped his greatest legacy. My grandfather was an amateur photographer. 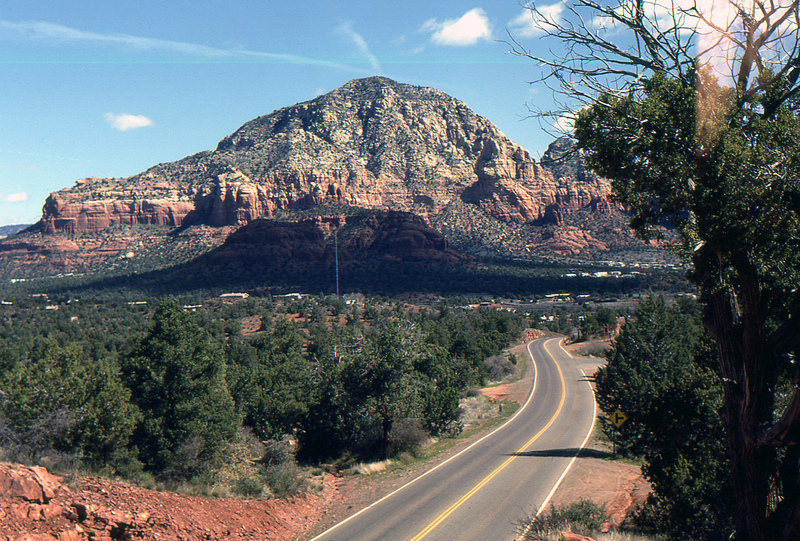 During rare vacations — and later, throughout his retirement — he took hundreds of Kodachrome slides showing spectacular vistas from across the country. When he came to visit us, he’d pull out the projector and regale us with stories of his adventures and the people he’d met along the way. After he died, my mother edited the collection down to 750 or so slides and wrote notes about the locations, people, dates and events she was able to identify. Then she gave the entire collection to me. For years the slides have been sitting untouched in boxes in my home office — most of them in their original projector carousels. A rainy weekend offered an opportunity to acquaint myself with the $80 scanner I bought at the beginning of the year. I decided to practice with it by scanning some of my grandfather’s slides. My grandmother, Cleora Smock, in 1969. When the first picture popped up on my computer screen, it took my breath away. 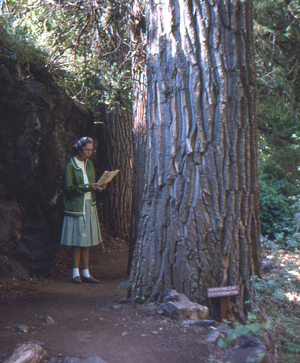 It was my grandmother, Cleora Wheeling Smock, looking at some kind of brochure or map as she stood beside a towering Narrowleaf Cottonwood during a visit to Gila Cliff Dwellings National Monument in New Mexico. The year was 1969. Not much later, she fell victim to the slow decline of Alzheimer’s disease. 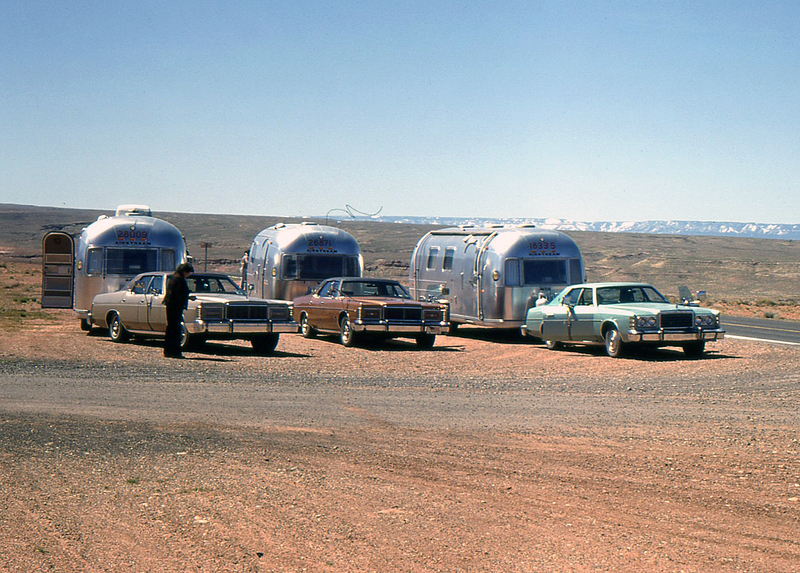 But that didn’t stop my grandfather — the stern, intolerant guy I feared in childhood — from taking her around the country as he always had, pulling their Airstream trailer behind them, tenderly dressing her when she became unable to do it herself. 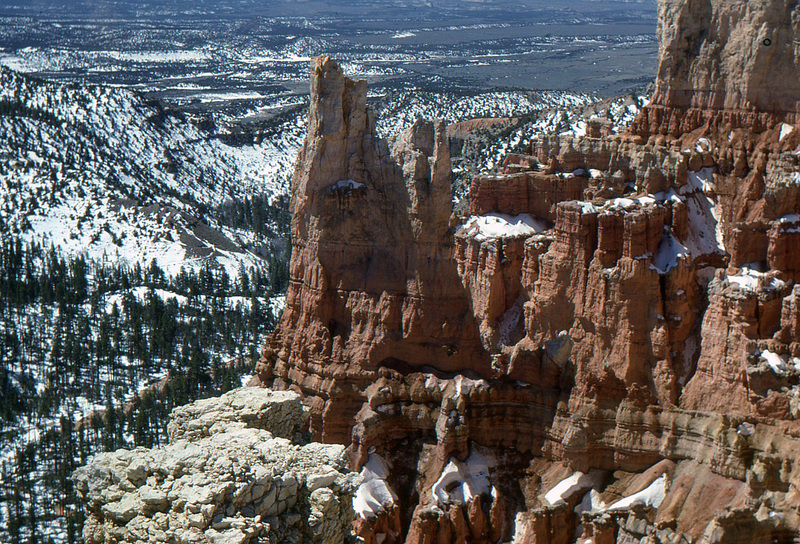 Bryce Canyon, Utah, 1979. Photo by Arthur Smock. During retirement, my grandparents caravaned around the country with his two brothers, Homer and Paul, and their wives. Untitled photo by Arthur Smock. My mother\’s notes indicate this may have been in, or on the way to, the Chricahuas in southern Arizona, in 1979. Untitled photo by Arthur Smock. 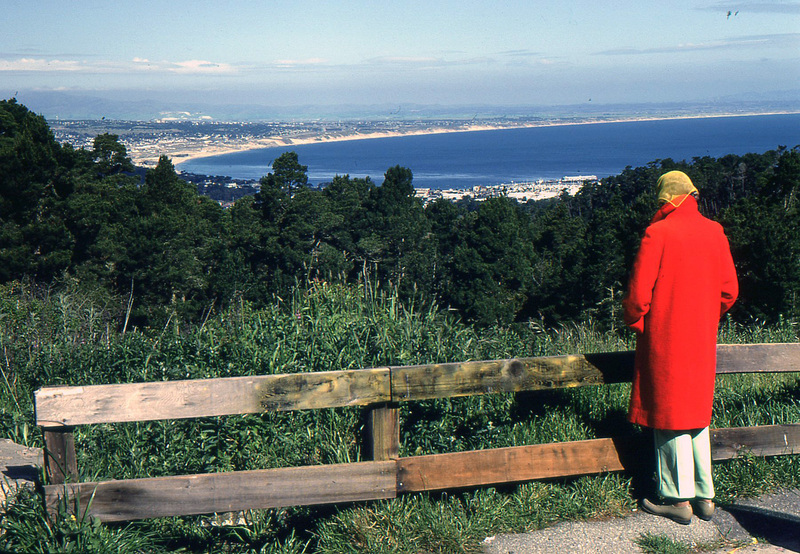 This photo of my grandmother in her red coat was taken in 1979, just three years before she died of Alzheimer/’s disease. This entry was posted in 1000 people to thank before I die and tagged Alzheimer's disease, amateur photography, archiving family history, dry cleaning business, entrepreneur, family history, geneology, grandfather's legacy, inspiration, Kodachrome slides. Bookmark the permalink. So beautifully written and displayed. For years I’ve wondered how I could write something that would capture the essence of my Dad. Love this- what a glorious surprise to see all of those slides! Lucky you! To my talented neice, Karen . . . I’m so proud of you! You captured our Dad so well in your writing, and it was good to see the pics of our mother, too. Your Grandpa Art certainly is unforgettable, especially to family and relatives who really knew him. Good luck with your lifetime project! Wonderful memories Karen !!! Thanxs for sharing them ! In love letters Art called Cleo his dark-eyed gypsy queen” and in her response she called Art her “One Man.” Reading those letters years after they were gone helped me see them when they were young and first in love. It lifted my grief and my spirits. Karen, thank you for this marvelous tribute to Art Smock. You capture the stern “life lessons” as well as his love of travel and photography with his “dark-eyed gypsy queen” by his side.